Compared with previous months and this time last year, February 2016 turned out to be quite a lean month for deals. Does this indicate a real downturn in deal making or is it more that companies are catching their breath prior to the next spate of deal activity? As we typically focus on the top 20 deals by headline value for the month, the relatively low number of pharma/ biotech deals provides additional room to look at some large medtech deals. 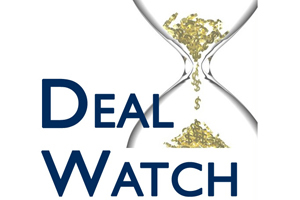 Five deals with headlines over $1bn are featured in this month's table, three of which are medtech or diagnostics deals. Top of the table is Mylan's acquisition of Meda at a price of SEK165 ($19.62) per share in cash ($5.7bn) and stock representing a total equity value of approximately $7.2bn. The deal value is approximately $9.9bn when including Meda's net debt, which represents a multiple of around 12.9 x 2015 adjusted EBITDA. The share price premium was 92% based on the share price the day before the announcement - which did not seem to impress the financial markets - and as a result Mylan's share price plunged. However, when calculated over the previous 90-day period the share price premium was 68%. This is the third bid Mylan has made to buy Meda and this time Meda's board recommended to its shareholders that the offer be accepted. Mylan's acquisition of Meda brings a range of prescription medicines thereby reducing its reliance on generics and will also boost sales in certain markets. Meda generated sales of approximately $2.3bn in 2015 from its portfolio of prescription and OTC products in a range of therapeutic areas including respiratory, dermatology and pain. The majority of Meda's sales (62%) are in Western Europe (mostly Italy, Germany, France and Sweden), with 19% in emerging markets (driven by China, Russia, the Middle East and Thailand) and 17% in the US. Abbott is paying $56 per share (a premium of 51%) representing a total value of $5.8bn to acquire Alere, a global company specialising in point-of-care diagnostics enabling rapid testing in a range of areas. Alere has annual sales of approximately $2.5bn from a portfolio of point-of-care products in areas including cardiometabolic, infectious diseases such as HIV, malaria, syphilis, E. coli and influenza, and in toxicology applications. While Abbott already has a significant diagnostics presence with global sales in 2015 in this segment of $4.6bn, it forecasts that the acquisition of Alere could increase its total diagnostics sales to over $7bn. Turning to medtech, Stryker has had a busy month acquiring two companies, Sage Products and Physio-Control, paying over $4bn in cash for the two transactions. The Sage Products acquisition from private equity owner Madison Dearborn at a price of $2.78bn (approximately 6.5 x sales) brings a portfolio of surgical products focused on the prevention of hospital acquired infections, which compliments Stryker's existing activities in medical devices and surgical equipment in areas such as orthopaedics, neurotechnology and spine. A couple of weeks later Stryker paid $1.28bn (approximately 2.5 x sales) to buy Physio-Control from Bain Capital. Founded in the 1950s, Physio-Control is a pioneer of defibrillator/monitor technologies and was owned by Lilly and then Medtronic before being bought by Bain in 2012. Physio-Control will provide a boost to Stryker's emergency medical response products and services business. One theme of note in this month's table of deals is the divestment of products by pharmaceutical companies. AstraZeneca, Sanofi and Otsuka divested or out-licensed rights to products in certain territories. Being particularly active in out-licensing, AstraZeneca has granted a licence to China Medical System (CMS) in return for $310m to sell Plendil (felodipine), a calcium antagonist for hypertension in China. Sales of Plendil in China in 2015 were $189m. In a separate deal with CMS and its associated company, Tibet Rhodiola Pharmaceutical Holding, AstraZeneca divested rights to Imdur in all markets outside the US in return for $190m. First launched in Europe in 1985, Imdur (isosorbide mononitrate) is an anti-angina drug in an oral extended release formulation with global sales outside the US of $57m in 2015. Another route to divestment is to out-license drug candidates to new companies that can dedicate R&D resources to progress the development of those assets. We have seen this for several of the large pharma firms and this month AstraZeneca licensed an antibody developed by MedImmune to start-up company Corvidia Therapeutics concurrently with Corvidia's $26m Series A financing. The antibody, to be known as COR-001, will be progressed for cardiovascular applications. This molecule had previously been in a phase I study for a different indication and was repurposed by AstraZeneca's Emerging Innovations Unit. Genomes, genes and nucleic acid therapeutics were back on the menu amongst this month's deals. Baxalta entered the chimeric antigen receptor (CAR) T-cell therapy area through its multi-programme immuno-oncology alliance with genome editing company, Precision BioSciences. With a headline value of $1.7bn based on all six programmes being successful, Baxalta is paying $105m upfront to gain access to Precision's ARCUS genome editing technology. The ARCUS technology enables the production of CAR T-cells derived from healthy donors (i.e. allogeneic or off the shelf) rather than relying on engineering cells isolated from the patient (i.e. autologous). The deal structure is typical of other multi-programme alliances we have reported in which Precision is responsible for early stage activities up to phase II, at which point Baxalta has exclusive rights to opt in for late stage development and commercialisation. In addition to the upfront payment, Baxalta could pay option fees, developmental, clinical, regulatory and sales milestones up to $1.6bn (approximately $267m per programme) plus royalties on sales. Precision also retains a 50/50 co-development and co-promotion option in the US. Gene therapy has seen somewhat of a resurgence recently with several deals being completed over the last couple of years. Indeed Baxalta already has ongoing gene therapy programmes for the treatment of haemophilia A and B. This month saw two smaller players, Nasdaq-listed Avalanche Biotechnologies and Paris-based Annapurna Therapeutics, merge to combine their gene therapy assets in a paper deal. Avalanche acquired the outstanding shares in Annapurna in exchange for approximately 17.6m newly issued Avalanche shares valued at around $106m; this gives the Avalanche shareholders 62.5% of the combined company. Avalanche's preclinical and research stage gene therapy programmes are focused on a range of ophthalmic diseases, such as wet age-related macular degeneration, utilising adeno-associated virus (AAV) vectors. Annapurna brings a portfolio of four AAV-based gene therapy programmes at the preclinical stage for alpha-1 antitrypsin deficiency, hereditary angioedema, cardiomyopathy associated with Friedreich's ataxia and severe allergy. Onxeo, the Franco-Danish oncology focused company formed when BioAlliance Pharma and Topotarget merged in 2014, has acquired French biotech DNA Therapeutics and its signal-interfering DNA (siDNA) repair technology as a new approach to the treatment of cancer. Onxeo is paying around $1.85m upfront in shares with downstream success-related payments of up to $27.5m per approved indication. The siDNA technology is based on short double stranded DNA molecules which can break the cycle of cancer DNA repair activities by interfering at the core of DNA damage and interfering with multiple repair pathways, while sparing healthy cells. The lead siDNA, DT01, has been tested in a phase I/II study in metastatic melanoma and Onxeo plans to investigate the potential of this approach in various solid tumours. We have commented in earlier Deal Watch articles on the importance of building relationships and good alliance management, which can often lead to expanded or additional collaborations between the same parties. This month saw two existing partnerships that have been extended. Takeda has been working with Mersana Therapeutics since 2014 to develop antibody drug conjugates (ADCs) using Mersana's Fleximer immunoconjugate technology. This month the companies announced their third agreement under which Takeda gains rights to Mersana's lead product candidate, XMT-1522, a preclinical HER2-targeting therapy, outside North America. The deal also gives Takeda additional access to the Fleximer platform while Mersana retains an option at the end of phase I to co-develop and co-commercialise one of these programmes in the US. The companies will also co-develop new payloads for use with ADCs. In return for the grant of rights, Mersana will receive $40m upfront and a milestone payment of $20m on FDA clearance of the IND for XMT-1522. Mersana could receive an additional $750m in milestones if the XMT-1522 and ADC programmes are successful, plus sales royalties. Takeda will also make an equity investment of up to $20m in Mersana's future financing rounds. While typically we do not focus on company investments in Deal Watch unless they are an integral part of a broader transaction, the $42.5m investment by Nestlé Health Science into Pronutria Biosciences is worthy of note as it represents a relatively new player in the field. Pronutria's focus is on the development of therapeutics and nutritional supplements for diseases caused by amino acid imbalances. The company is developing oral biologics that deliver disease specific amino acid compositions to restore balance in disease pathways in indications such as muscle, neurodegenerative and liver diseases. Nestlé has stated it wants to build a significant business from its Health Science unit focusing on food-related products for the treatment of chronic diseases. It is certainly reassuring to see additional sources of funding coming to the industry. Jill Ogden has over 28 years of commercial and R&D experience in the biopharmaceuticals and healthcare industries and provides biologics, early stage deals and platform technologies expertise. She has worked for a number of mid-caps and biotech companies, both public and private. Jill has led and been involved in a wide range of product and technology deals, including corporate M&A.